Aston Villa XI: Guzan, Hutton, Richards, Lescott, Richardson, Bacuna, Gana, Ayew, Grealish, Agbonlahor, Gestede. It's over at Villa Park as the home side suffer a a sixth straight defeat. Joleon Lescott has a chance for Villa from a corner but volleys over from eight yards. This time it is the other Ayew who scores and it's not good for Villa. Kyle Naughton plays a dangerous low cross to the far post and Jordan Ayew is on hand to sidefoot in to put his side in front. Jonjo Shelvey sidesteps Villa defender Joleon Lescott and has a sight of goal but slices his effort wide. That's his last action as he is replaced by Jack Cork. Villa's Jordan Ayew has a shot from just outside the area but he doesn't get enough power behind it and Swans keeper Lukasz Fabianski easily saves. There's no brotherly love at Villa Park as Jordan Ayew looks to get away down the right flank but is brought down by his brother Andre. Swansea bring on Modou Barrow for winger Jefferson Montero. Villa boss Tim Sherwood takes off Jack Grealish and brings on midfield playmaker Carles Gil. "Gylfi Sigurdsson was lucky to win the free-kick, it was a dodgy one. But he is a wizard when it comes to dead balls." Villa's lead didn't last for long as Swansea level with Gylfi Sigurdsson sending a curling and dipping 25-yard free-kick past the despairing dive of keeper Brad Guzan. What a bit of action. Bafetimbi Gomis plays in an unmarked Andre Ayew and he has a shot smothered by the on-rushing Villa keeper Brad Guzan. The home side counter-attack from a corner and go up the other end to score with Jordan Ayew stooping to head in a Gabriel Agbonlahor cross. Bafetimbi Gomis seems to catch Joleon Lescott unawares as he races on to a ball to the right edge of the Villa box but the Frenchman's ambitions shot curls wide of the far post. Villa are looking more of a threat than the visitors but they are just lacking that bit of quality they need in the final third. More intent from Villa. Leandro Bacuna gets past Swansea left-back Neil Taylor and fizzes a ball across the visitors' six-yard line but none of his team-mates can get on the end of it. Villa have started positively after the break. Jack Grealish finds striker Gabriel Agbonlahor and he tries to curl a shot in to the far post only for his effort to go wide. He might have been better to lay the ball across to Jordan Ayew who was running in unmarked on the far side. "A very cagey and uninspiring half. Both sides guilty of giving the ball away cheaply as they try to force the issue." Villa striker Rudy Gestede is a handful in the air and he gets in between two Swansea players to meet a corner but heads his effort high. You can tell both these teams haven't won in a while. there's a lack of confidence and quality to their play. A Leandro Bacuna free-kick goes straight into the arms of Swansea keeper Lukasz Fabianski. In the aftermath, Villa defender Micah Richards squares up to Federico Fernandez and Ashley Williams comes in to help out his Swansea team-mate. Richards switches his anger to Williams as the two are involved in a bit of shoving before they are both booked. All from nowhere that. The first booking of the afternoon goes to Swansea right-back Kyle Naughton for a foul on Jack Grealish as he tried to make up for losing the ball. Aston Villa striker Rudy Gestede overpowers Swansea midfielder Ki Sung-Yueng to a ball forward and the striker gets in a shot but it goes comfortably wide. Stll, at least it's a shot for the home side. Swansea look like they might be finding a bit of rhythm and Villa boss Tim Sherwood is shouting and gesticulating from the touchline as he tries to urge his side forward. Swansea should be ahead. Jonjo Shelvey's corner is headed down by Bafetimbi Gomis for Federico Fernandez but he can only horribly slice a shot wide from about eight yards. Swansea work a move which sees midfielder Jonjo Shelvey find striker Bafetimbi Gomis and he lays the ball across to Gylfi Sigurdsson, who curls a low shot wide from just outside the area. 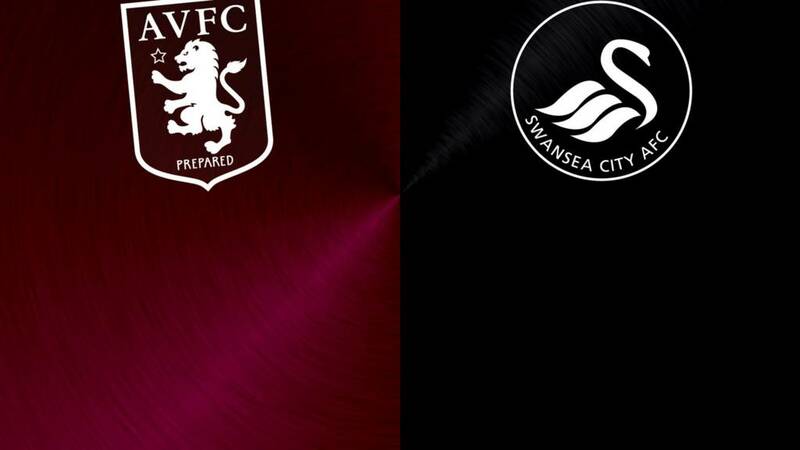 Villa have a free-kick from the right side of the area after a Neil Taylor handball and Kieran Richardson sends a striker from the set piece straight at keeper Lukasz Fabianski. "Andre Ayew is one of those that we'd have to say is a good signing for the Premier League as well as Swansea. For Jordan it's not gone as well but we don't know if that's because Andre's in a better team." The Ayew brothers of Andre and Jordan are on opposing sides today. Andre has been impressing at Swansea, while Jordan has found life difficult at struggling Aston Villa. "Former owner Doug Ellis being helped into his seat at Villa Park. He's a regular to home games here despite being in his 90s now. A penny for his thoughts on things at the Aston Villa at the moment?" Asked about speculation Swansea chairman wants to bring in a more experienced figure to work alongside him, the club's manager Garry Monk played down such reports. "The chairman is fantastic," said Monk. "He is very supportive of what I do and lets me get on with it. "The good thing about this club and working with him is that he allows me to grow as a manager. He's done that since day one. "We have regular chats about numerous things because he is the chairman of the club. "He likes to see what's going on, but he sees how I work, he sees the commitment and effort I put in and the quality of what we are doing and he supports it." It is only October. Surely too early too talk about sides being relegated. Well, Jermaine Jenas has already written Aston Villa off. “I don’t think they will be in the Premier League next season," Jenas told BBC Radio 5 live. "They had better players last year. It is a sinking ship, unfortunately, at Aston Villa. "If ever there was a game to kick-start a team's season and boost a manager's position, this is it for Aston Villa and Tim Sherwood. They must capitalise on being at home and against a team without a win in their last six matches. "Sherwood has called for his team to be brave, and will hope that he'll witness an injection of confidence. They have suffered more league defeats in 2015 that anyone else. That mentality doesn't change overnight. "Swansea are also looking for a timely lift and will try and use the anxious atmosphere to their advantage." Slight change to BBC Radio 5 live's football coverage today, due to the Rugby World Cup semi-final being covered live. But, don't worry, Sports Extra will be broadcasting a “Football Special” from 14:45 BST with commentary of West Ham v Chelsea at 15:00 BST, plus all the goals as they go in across the English and Scottish Leagues. Don't forget you can listen online on this page. You can also watch Final Score on BBC One from 16:00 BST in England, Wales and Northern Ireland, and on this page. You can view on the red button from 14:30-17:25. Aston Villa boss Tim Sherwood bring in defender Leandro Bacuna and striker Gabriel Agbonlahor for Ashley Westwood and Carles Gil. Swansea boss Garry Monk makes three changes as Kyle Naughton, Ki Sung-Yueng and Gylfi Sigurdsson replace Angel Rangel, Jack Cork and Moduo Barrow. If you love the magic of the FA Cup then the BBC is the place for you. There's live radio commentary on 20 of today's fixtures and updates from the other four matches. Also, we have a live text commentary for you here which will have everything covered. Aston Villa boss Tim Sherwood led his side to the FA Cup final last season and steered them to Premier League safety but, after one point from the last eight games, he is under the cosh going into today's game at Swansea. "I am telling the players it's a must-win because we need to win a game sooner or later," he said. "This is a cup final. Forget Wembley last season, this is a cup final. "It isn't a bigger game in my mind, it's the next one, but it is a massive game, not only for me but for them as well. "They all want to be Premier League footballers and this club needs to be in the Premier League. I know we will be and they need to know we will be. They will only do that by winning games and getting that confidence." Aston Villa boss Tim Sherwood says his struggling team's game today is a 'cup final' so he will be hoping for more of a performance like his side's FA Cup semi-final win over Liverpool last season rather than their tame surrender in the final to Arsenal.